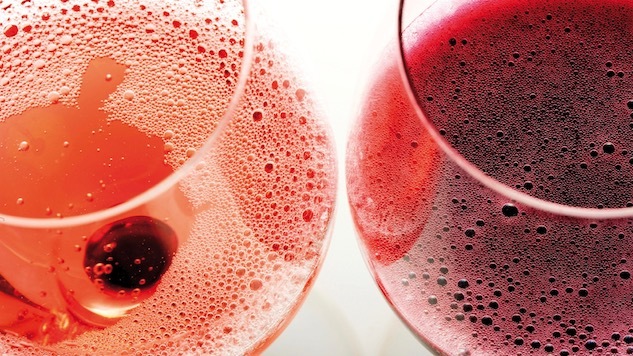 If you’re not used to it, the idea of a red sparkling wine can be a little weird. But Lambrusco, a collection of closely related northern Italian grapes (the sub-types are named for their region but they’re all “Lambrusco”) whose best expressions are generally frizzante or slightly frothy, can be a wonderful, festive drink especially if you’ve found yourself suffering from Bored Palate Syndrome. Lambrusco is not Champagne. It’s not made the same way (it is charmat or tank-fermented style), and where the pinots and chardonnays of Champagne are painstakingly manicured and trellised and micro-managed to the last leaf, Lambruscos are commonly trained on the trunks of poplar trees. It’s been cultivated at least since the Roman Republic and probably quite a while before that (think Etruscan). It can be dry, off-dry, or sweet (sweet expressions can be disconcertingly like fermented soda, I won’t lie to you). Good Lambruscos are young, expressive and celebratory, and actually might make a nice aperitif with, say, Thanksgiving dinner (many have a pronounced cranberry note). These wines will also typically exhibit notes of raspberry, rhubarb, and cherries or pomegranate, often with a hint of violet. It’s not always the easiest varietal to find outside its native region (but my suburban pizza joint often pours at least one by the glass during fall, so it’s not that obscure), but you’ll be rewarded for your effort by a great quality to price tier ratio: The bottles listed below all won awards this year and none of them is over $20. In fact, pricing info was so varied I have left it off, but in general, expect anything labeled “DOP” to be $8-$18, and anything marked “IGP” to be $6-$12. Pairing-wise, Lambrusco is more versatile than you’d think, but for starters, any typical dishes from its homeland, Emilia-Romagna, are smart choices (think prosciutto, salumi and parmesan). Delightfully dry, yet juicy. Fruity nose, and a raspberry-violet finish. Brilliant ruby color, loosely frothy. Cleto Chiarli is one of the Lambrusco makers you are most likely to encounter casually, which is cool because they’re great. Beautiful color, light fizziness, fresh fruit character (a little watermelon in this one). Bright pink color, nice mousse. Heady floral nose, strong tart cherry note on the palate, hints of violet and cranberry. I really like this one, especially with good salumi. This is a “fruits of the forest” fest, pleasantly dry and a tiny bit feral. Redcurrant and rosehip nose, berries on the palate; youthful with discernable but soft tannins. Residual sugar alert! The term “semisecco” means what it sounds like it means: Off-dry. It’s set off nicely by an unusually pronounced salinity. Dominant note is wild strawberry. Intense color, almost purple. Finish is juicy and compact. Dry, red-fruit-forward, pleasant acidity. This is a wine that likes meat, but if you don’t, it’s probably also interested in root vegetables and winter squash. Rich, dry, very aromatic. Blueberry and violets dominate. There’s also a bit of blackberry and tart cherry. Finish is sweet but not sugary. Just flowery and delicate.